We’ve Got Sales Enablement All Wrong! 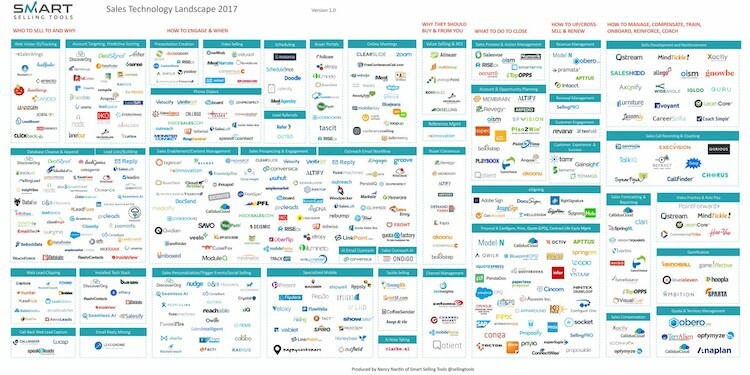 When I first saw Nancy Nardin’s 2017 map of the Sales Technology Landscape, I was surprised at both the scope and sheer number of applications. Nancy’s map helped to clarify a long-standing concern I’ve had about sales enablement. What happened to “People, process, then technology”? With all of these technology platforms, we are choreographing all of the steps for sales people to take in their engagement with customers, without leaving room for flexibility or inquisitiveness. While many think that’s a good thing, it’s not! The goal of sales enablement is not the efficient delivery of content assets to sales people; it’s about changing seller behavior to drive deeper, more productive customer engagement! We are taking some of the most creative thinkers in the company (if you don’t agree, take a look at some of their expense statements) and stuffing scripts down their throats. We’re forcing them to solve difficult and complex problems, with lots of uncertainty, through prescribed processes rather than critical thinking and co-creation. And this isn’t just a problem for inside sales or commercial account reps. I’ve seen this problem in enterprise and key accounts. Organizations find it more efficient — and predictable — to develop “the approach” and then staff to that approach. And then they hang on to that approach long after market dynamics have changed. Thought leaders (good sales people) are more difficult to manage. They don’t always follow the prescribed path, they push back on the corporate product marketing message, they like to do things their way. It gets messy. Yet thought leaders, trusted advisors, good sales people can be dramatically more effective when engaging with executives and stakeholders in customers’ organizations. And in my conversations with C level management and stakeholders, it’s the problem solving qualities and inquisitive nature of the trusted advisor that are top-rated. Why do we throw out everything we know about cognitive development and experiential learning when it comes to sales? Think about how you learned to ride a bike, drive a car, play soccer or train a puppy. Lots of modeling, immediate feedback and small, timely corrections. Exactly the opposite of how we “enable” sales people. When we seek to develop and reinforce repeatable skills in other areas, our approach is dramatically different. We don’t onboard, certify, set free, monitor from afar, wait three months to evaluate, and then provide remedial counseling. Can you imagine coaching a U12 soccer team that way? Cognitive development focuses on thinking and problem solving. New knowledge is built on the foundation of prior knowledge.The learner must actively process the prior knowledge to improve. Experiential learning theory suggests that without observation and reflection, people will continue to repeat their mistakes! And the theory works whether we’re talking about learning to ride a bike for the first time or flying a jumbo jet. Airlines are now providing immediate feedback to pilots in these new aircraft. Within minutes of take-off, the pilot gets a report on his departure, immediate feedback and coaching — angle, speed, etc., with the goal of reducing the risk of dragging that extra long tail during take-off. New environment, change in behavior needed, high cost of failure — feedback delivered at the most useful time. Programmed sales plays and generic sales enablement assets do exactly the opposite…they lead the rep down a path where the steps are pre-planned and thinking is largely optional. No immediate feedback on the action just taken. No foundation for learning from prior experience, no real opportunity to modify the approach for the next conversation. We drill a specific approach in training and reinforce that approach with preprogrammed assets in sales enablement. We’re building muscle memory without regard to whether those individual activities, the day to day activities of pipeline and opportunity development, are generating the desired results.We are building bad habits. We are building them very efficiently…but they are still bad habits that do not deliver the desired results. We are setting our sales people up for failure! Why do we shortchange our sales professionals? Why don’t we evaluate their day to day activities — each call to a prospect, each email to a new contact, each conversation with a key stakeholder? Why don’t we suggest minor, immediate changes to their approach, as they move on to the next conversation, so that they will have greater likelihood of success right away…rather than reinforcing the muscle memory of an imperfect approach? How about we create an environment in which they can self-evaluate? If I’m about to send a set of discussion notes to a prospect, I can run a quick evaluation of the document to determine whether it’s inwardly focused (about me) or customer-focused (about them). After running that evaluation a handful of times, my writing will become more customer focused. Simple, yet nobody helps reps to help themselves. We’re too interested in simple click metrics…rather than the contents of the message and improving the process with each swing of the bat (so to speak). Why don’t we leverage the learning of what worked this afternoon…on a call with a CFO…for the next call to a different CFO…by a different rep. Instead, we choose not to gather that feedback and improve the skills of all the team members. Organizational hubris — our company builds a better product or service. We can win on the merits of the product itself and the sales person really isn’t that important. If we didn’t really believe our product was better, we’d be working somewhere else. Developing “soft skills” is hard — we’re not sure how to instantiate the role of coach and focus on those small, incremental improvements that prove so critical in other areas. We don’t understand how that might scale. We’re not sure where the low hanging fruit is. Why can’t we just hire the right people and hope for the best? How do we monitor all of our sales people and provide timely feedback? Isn’t that kind of creepy, big brotherish? With regard to the first, customers just don’t care! If you pay close attention, you’ll see prospects dozing off each and every time you bring out the corporate “brag” deck, list the wonderful new features of your upcoming release, and reiterate why you’re the only game to consider. It is of ZERO value to them. What’s the level of organizational risk if we choose to go with this vendor, versus the other, or versus doing nothing? What could go wrong? What might the impact be on our organization? Few people get fired for choosing BAU; many get fired for failed ERP implementations or SFA delays. What’s the level of personal/career risk if we choose to go with this vendor? If this choice keeps me from delivering on my organizational commitments, I can kiss my MBO goodbye, and maybe my future in this organization. Sales people can mitigate that risk, both perceived and actual, by being inquisitive, personable and focused on problem solving and co-creation. Literally, they must move to the same side of the table or “get in the boat” with the customer. I’ve worked with teams that have accomplished this transformation; the results are nothing short of magical. I’ve facilitated strategic account planning for some of those teams in their customer’s executive boardroom, with the active participation of the customer. With regard to the second and third concerns…it’s time to think outside the box. How about we gamify sales skill development? How about we build the “cooking” into the process for the rep, so that while they are doing their job (no stepping outside day to day activities for coaching/reinforcement), they receive positive reinforcement for doing something well? What added confidence would you have in your pipeline if your customer helped to identify the strategic, funded projects and then guaranteed time and access discovery? I am calling for a different approach to sales enablement, one that leverages the science of learning rather than the efficiency of automation. I am calling for a new conversation with prospects and clients, focusing on their language of value and their strategic business problems. The sales rep needs to leave the organizational hubris in the lobby; it doesn’t serve the customer any good. Instead, the sales rep must be inquisitive about their customer’s business, good “behaviors” reinforced, and individual learnings shared with other team members. I know sales people are capable of this approach and more. I’ve worked with many who do this every day. I’ve also seen organizations beat the creativity out of those people, put them in boxes, and force them to recite the corporate mantra. If any of this strikes a chord with you, call me, email me. We have work to do. Lets focus on changing behavior at the top of the funnel, where value is established and relationships are built (or not). Looking forward to the conversation..